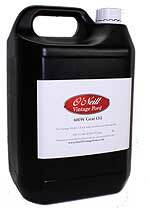 New product, now available again! New shifting fork for the Model A transmission. Worn shifting forks can cause misaligned gears and cause a transmission to slip out of gear. 2 are required. Transmission bolt set containing the external bolts and washers for the Model A Ford gearbox. Consists of filler plugs, clutch housing to flywheel housing bolts, tower bolt set, inspection plate screws and dust cover bolts. Gearbox rebuild kit for the 1928-31 Model A Ford car 3 speed gearbox. Save pounds with this rebuild kit, which has everything apart from the actual gears themselves. 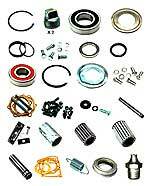 Consists of bearings, shafts, snap rings, spacers, baffles, gearbox and universal joint gaskets, grease fittings, modern rear gearbox seal kit A-7111-S , drain plugs, gearbox and universal joint bolts, clutch release bearing and clutch release spring. Gearbox Main drive gear for the 1928-31 Ford Model A Gearbox. Gearbox main drive bearing 1928-48. 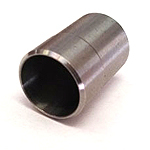 This ball bearing is used on the main drive of the transmission. Shielded on one side. Gearbox main drive Baffle 1928-48. The transmission main drive gear bearing oil slinger. Gearbox main drive Snap ring for the Model A Ford Gearbox. which holds the bearing in place. One piece construction, just like the original. Four 5/16-18 x 3/4 bolts and washers to hold the bearing retainer tube to the front of the transmission case. Gearbox Main shaft 1928-31. The main shaft of the transmission. 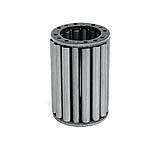 The roller bearing surface should be checked on your old shaft. Gearbox Main shaft collar for the 1928-31 Ford Model A Gearbox. Gearbox Spacer for the 1928-31 Model A Ford gearbox. 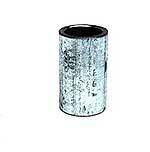 This spacer must be used on main shaft, to keep the bearing from being damaged. Made in U.S.A.
Gearbox main shaft bearing 1928-48. 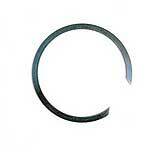 This bearing is used on the main shaft of the transmission. Shielded on one side. Gearbox Snap ring 1928-31. Goes in the transmission case in the front of the rear ball bearing. Gearbox main shaft Baffle 1929-31 for the Ford Model A Gearbox. A brand new U-Joint assembly, Ready to install. Don't forget that 14 oz. 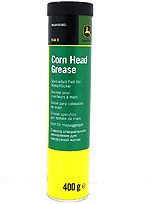 of grease needs to be pumped into the U-Joint housing. U-joint rebuild kit 1928-31. If the old U-joint is not doing so well, this may be the alternative to buying a new U-joint. This kit gives you the cross, bushings, and the lock rings. Does not work on the early universals that were riveted together. Slide the U-Joint onto transmission main shaft. 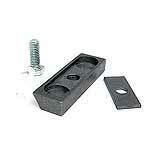 Insert special tabbed washer (tabbed side goes in first) then lock washer and 3/8-24 x 1 bolt. This will hold the U-Joint in place. Universal joint housing bolt set, thick head 1928-31. Complete set of bolts, nuts and cotter pins for assembling the U-joint housing. Bolt set to hold the retainer to the rear of the transmission case. Set consists of four 7/16-20 x 1 bolts with the head cross drilled for safety wire and lockwashers. Install grease fitting on the retainer towards the bottom. 1928-31 Low & reverse gear for the Ford Model A Gearbox. Second and high sliding gear 1928-31 for the Ford Model A Gearbox. 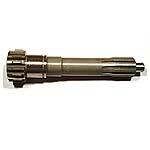 Cluster gear shaft 1928-31. For the Model A transmission. 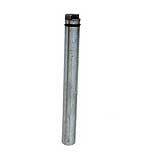 Shaft is fitted with an O-ring to help keep the oil from leaking by. Stop putting up with oil running all over the shop floor. This kit seals both transmission shafts. Will only work on later style transmissions that had the 1/8" thick shaft retaining plate. Front Gearbox seal 1928-31. Mounts inside the bell housing and seals the two holes where the shifting rails stick through. This is a common area for oil to leak by. Installs through the inspection cover plate of the bell housing. This plug will help to eliminate oil leaks from the shift rails where they come into the bell housing. You will need two of these. Cluster gear for the 1928-31 Model A gearbox. Cluster bearing spacer 1928-31. Spacer that goes between the two roller bearings inside the cluster gear assembly. Gearbox Short Bearing 1928-50. Two of the short bearings are used. Gearbox Long bearing for the 1928-50 gearboxes. This is the long bearing for the rear of the cluster gear. 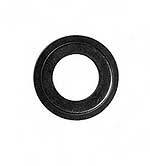 Gearbox Thrust washer 1928. A bronze thrust washer for the cluster gear. 2 required. Reverse idler shaft 1928-31. The shaft for the reverse idler gear. Fitted with an O-ring to help keep the oil from leaking. Reverse idler gear 1928-31 for the Ford Model A Gearbox. 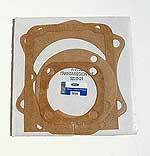 Transmission gasket set for the 1928-31 Model A Ford. All the gaskets needed for overhauling the transmission. 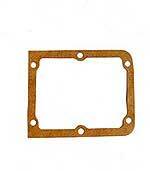 Transmission cover gasket 1928-31 for the Ford Model A Gearbox. Gear lever for the 1928-31 Model A Ford. This chrome plated gear shift lever will fit all of the Model A Fords. Gear shift knob for the 1928-36 Fords. 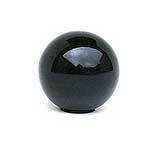 The original type was like this one, black hard plastic. 5/16-24 thread. Transmission top bolts 1928-31. Set of bolts needed to attach the transmission top plate to the transmission. Gearbox Hole plug 1928-31. This is the plug that must be removed from the transmission cover in order to access the A-7233/34 plunger & spring. Gear shift spring tool for the Model A Ford transmission. This is a much safer tool for removing or installing a gear shift lever, than the length of pipe style tool, that could slip off and cause serious injury. 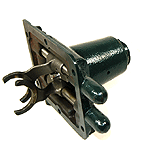 This tool safely compresses the A-7227 spring in gear shifting tower, so you can install the spring retainer. This professional set of tools provides a safe and easy method of disassembly and assembly of the Model A transmission shifting tower components. Shift lever spring for the 1928-31 Model A gearbox. This is the long spring that holds the gear shift lever in the gear shifter housing. 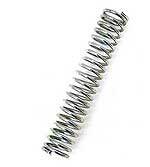 Shifter Spring retainer for the 1928-31 Model A gearbox. 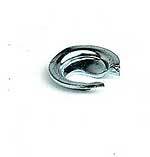 This little clip holds the long spring in place on the gear shift lever. Shifting fork pins 1928-31. 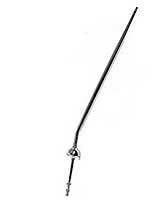 Holds the shifting forks onto the shaft for the gear shift. Set of 2. Shifter plunger/spring 1928-31. 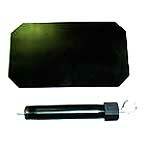 Each kit contains 2 hardened plungers and 1 spring. 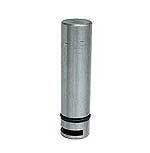 These mount in the transmission tower and slip into the notches in the shifter shafts. If the plungers in your transmission are worn, your car will have a tendency to slip out of gear! 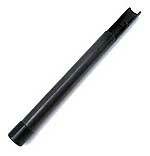 Shift fork shaft for the low/reverse gears. The shafts in the tower of the transmission that the shifting forks mount to. This one has the 3 detents equally spaced. 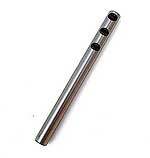 Shift fork shaft for 2nd/High gears. The shaft in the tower of the transmission that the shifting forks mount to. 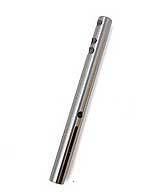 This one has two detents very close together and 1 near the end of the shaft. Gear shift seal retainer 1928. A rubber seal was used originally until Feb-March of 1928 to seal the floorboards to the shifter. This metal ring nailed to the floorboard to retain that rubber seal. Nails included. cad plated plugs for the oil fill hole and the drain hole as well. 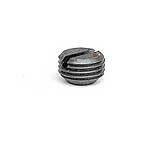 Clutch housing-transmission bolts 1928-31. 4 bolts and lock washers to bolt the transmission up to the clutch housing. Gearbox Dipstick kit for the 1928-31 Model A Ford. The kit gives you a tube with a dipstick that threads into the oil filler hole and a plate just like your battery cover plate to access the dipstick. You will need to cut a hole in your floorboards for the access plate. (A template is included).